John and I are going to Italy next month which, for the cuisine alone, will be extremely special for us. In the meantime, I thought it would be fun to make a summer-inspired Italian dish that placed tomatoes, the gems of summer, at the forefront. As John and I perused the tomato section at our market, I started sharing my idea for this pasta and how I wanted to blister some small heirlooms or something. And as we walked passed a grocer, he began telling us, without turning around or lifting his eyes from his task of sorting vegetables, that his new batch of sun gold tomatoes were the perfect candidate for the pasta I was describing. He encouraged us to taste a couple and we immediately fell in love with their astonishingly and unexpectedly bright and juicy flavor. It was then that I knew I was on to something. When it came around to putting the pasta together, everything came together so well. Blistering the tomatoes magnifies their flavor and, mixed with some olive oil, coats the pasta to the perfect extent. I incorporated garlic and chili flakes to provide a spicy contrast to the sweetness of the tomatoes. The thyme and garlic breadcrumbs not only provide more dynamic texture, but also a nice herbaceous aroma. Parmesan-reggiano’s distinctive, sharp, and nutty taste completes the dish very well. I landed on La Crema’s 2015 Monterey Pinot Noir as the ideal complement to this pasta, with its notes of cherry, orange, and rhubarb bringing a welcomed tangy and citrusy aspect to the overall experience. Head over to La Crema’s blog for the full recipe. It was just over a year ago when I first met Kate, from Cookie and Kate. At the time we were both in Vermont exploring all things cheese with Vermont Creamery. In between eating our weight in cheese, we got the chance to chat about her book that would be coming out in the next year, and now here it is! I've known about Kate's blog since before I even started blogging so it's a real treat to finally have her book in my kitchen. Kate's book, Love Real Food is a collection of beautiful, simple, and vibrant dishes that range from snacks, to deserts, to full meals. 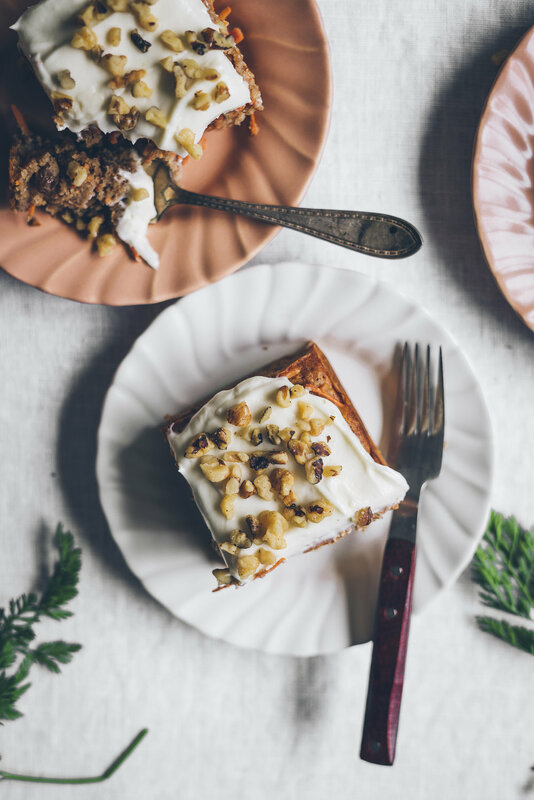 I have already made a few dishes from her book with great success and this carrot cake is proof of that. Carrot cake and I go way back. It's actually one of the first cakes I remember liking when I was little. As soon as I found this recipe in her book, I knew I had to share it with you guys. This cake is absolutely filled with carrots, about a pound of them to be exact. Also, whole wheat flour and maple syrup makes this cake a little more wholesome than most carrot cakes I have enjoyed in the past. This cake comes together with little effort and tastes like a dream! I made two super small changes to Kate's recipe: 1) I left out the walnuts and saved them for a garnish (my husband is allergic to nuts, so as a garnish I was able to keep them off a slice for him) and 2) I added raisins to the batter. It's so funny, I hardly ever use raisins in my baked goods, but all the carrots cakes I've enjoyed in the past have had them so I couldn't resist adding a few. To make the cake, heat over to 425°F. Grease a 9x9-inch baking pan. In a large bowl, whisk together the flour, cinnamon, baking powder, baking soda, and salt. Add the grated carrots, raisins (if using) and walnuts, stirring a few times to combine. In the medium bowl, whisk together the maple syrup and oil of choice. Whisk in the eggs, once smooth add the yogurt and vanilla and continue whisking until smooth. Add the wet ingredients to the dry and mix with a big spoon or spatula until just combined (a few lumps are okay). Pour the batter into the prepared pan and place in the oven. Bake the cake until the center is springy to the touch and a toothpick inserted into the center comes out clean, 26-28 min. Transfer the cake to a cooling rack to cool completely. To make the cream cheese frosting , place the butter and the cream cheese and beat until fully blended. Add the powdered sugar and vanilla, then continue beating until a creamy frosting is achieved. Spread all of that yummy frosting all over the cake once it has cooled and enjoy! Stone fruit is everywhere and after last week's trip to the market I ended up with a pretty nice haul of the most beautiful plums. Since I had so many plums, I decided to make a cocktail with them. I have really been enjoying prosecco lately so I created a drink inspired by the oh-so-classic peach belinni. For this drink, I switched out peaches for plums, puréed them, and paired them with just the right amount of procescco. And with my trusty Wolf Gourmet Blender, I put one of these drinks together in no time. The vibrant color of this puree is matched by its excellent and refreshing taste—perfect for these final sunny days we have coming our way. 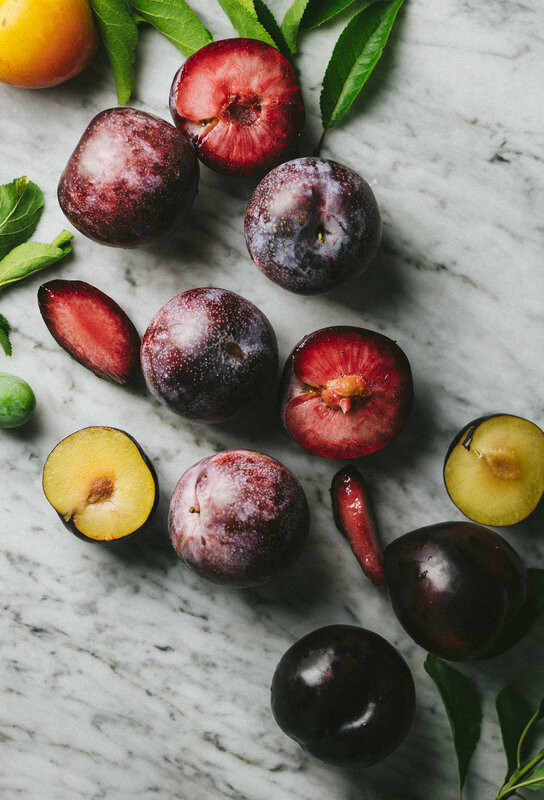 To get the recipe, head over to the Wolf Gourmet blog so you can make some of these plum belinnis while summer is still here. Summer is nearly come and gone in Seattle. And what we’ve lacked in hikes and camping trips we’ve made up in countless trips to patio-laden breweries, open-air restaurants, and forest-saturated parks. The sun indeed still shines, but the brisk breeze of fall is in the evening air and we know the season’s turn is upon us. In these final summer days I’m always coming up with ways to make the most of it—and this zucchini salad simply won’t quit. This recipe is actually much like a pasta salad with zucchini taking the traditional place of noodles. This is a great way to capitalize on incredible seasonal produce while imparting a refreshing taste and texture. Avocado comes alongside for a buttery layer, while cucumber keeps things crisp. Corn and feta lend a sweet and salty dynamic while a lemon-based dressing wraps everything up with a pleasant bite. It’s a straightforward salad, but it’s so good. The flavors of this salad are satisfyingly complemented by La Crema’s 2015 Monterey Chardonnay. It’s oakey and tropical with some refreshing citrus and a textured bite akin to crisp carbonation. It ends with a touch of spice that works very well with the salad’s lemon dressing. Don’t let summer die—fetch some produce at your farmer’s market and keep it alive. Be sure to head over to La Crema's blog to check out my recipe for this Summer Zucchini Salad. Thank you so much for supporting the brands that support The Broken Bread. This is a sponsored post, and as always, all opinions are my own. Comté Cheese: perhaps a familiar, household name for some of you, perhaps merely the title of an exotic dairy varietal for others. Whatever the case, Comté cheese deserves to be known and enjoyed. John and I recently had the chance to visit the Comté region of France to enjoy a guided tour of their cheese production process, and it was exhilarating. Our main guide, Jean-Louis, took a small group of us all around the region, introducing us to the culture and techniques of Comté cheese. Since I’ve started this blog I have had incredible opportunities to learn the history, story, and culture of some of my favorite companies. And I must admit that though I left on this trip with only a general knowledge of Comté, I now have a tremendous amount of respect and appreciation for everyone that has made Comté what it is today. First of all, Comté’s philosophy of work and craftsmanship is astounding, and it puts into practice principles that anyone from any field of work could respect. It all begins with a heart of intentionality and sincere passion. One of the farmers we met, an eccentric, boisterous individual nicknamed Taz, put it perfectly: “All of us at Comté are always asking ourselves, ‘why do we wake up in the morning? Why do we do what we do?’” Such questions accurately express what’s at the heart of Comté’s commitment to excellence, to quality, and to community and legacy. They wake up in the morning because they’re coming together with families and with whole towns and regions continuing a centuries-old tradition of crafting amazing, sustaining cheese. They’re honoring and cultivating their ecosystems, they're stewarding their livestock and landscape, they're providing for families and communities, and what they make is simply a piece of art (especially delicious art!). Here are some examples of what this philosophy look like in action. Comté cheese insists upon the importance of cultivating the natural yield of the landscape and ecosystem, and they refer to this as “terroir.” Terroir is the catch-all term for a region’s natural environment and habitat in combination with specific practices that draw out regional characteristics to impart a unique quality to the final product. And so terroir is just as rightly applied to wine or chocolate or coffee or scotch as it is to cheese. But many companies try to use external chemicals, ingredients, additives, and extreme practices to squeeze and manipulate the yields of many different regions and habitats into a single taste-profile for consistency and marketability. Comté cheese totally eschews this notion, avoiding all additives and any unnatural ingredient or processes. They instead respect the land and the yield and proceed to produce the best possible cheese that most clearly reflects the source from which it came. Accordingly, we saw these convictions turn up in everyday practices, whether we were visiting the farms, the cheese-making facilities, or the maturing cellars. On the farms, Comté takes great care to ensure that the hay in their region is the highest quality, and that the flowers and vegetation that come along with it are protected and included. They only use two types of cows whose milk is amazing for making cheese–the Montbeliard and French Simmental. They refuse to use any machines for milking the cows, they only milk them by hand, and they only milk them twice a day. This ensures that their cows remain comfortable, healthy, and happy. At the cheese-making facilities, Comté refuses to use any additives or added chemicals in the process of turning the milk into cheese. They keep very clean conditions, yet also sustain a controlled environment conducive to the production of natural bacteria that are vital to the cheese-making process. They call their facilities “Fruitières” because this is where the reap the “fruit of their labor”—it’s all linked to the mindset of honoring a legacy of working hard and providing for those around you. Pretty inspiring if you ask me. A maturing cellar for Comté cheese is called an “affineur” and they meticulously age their wheels in a precisely conditioned environment. The cellars are essentially giant refrigerators, some housing tens of thousands of wheels at the perfect temperature and level of humidity. Comté ages their wheels exclusively on spruce boards for a minimum of 4 months but for no real maximum. While exploring one cellar, we had the chance to taste a cheese aged for over 3 years—we’ll likely never taste a better or older cheese for the rest of our lives. All of this leads to an astounding creation. Each wheel of Comté is so responsibly made to reflect the terroir of its French domain that it’s actually impossible to make the same wheel twice. Every wheel is a distinct, unique, and unrepeatable expression of Comté cheese. Now what I said might sound strange—how could you run a business without any expected consistency from your product? How could you even make this marketable? Well first, every wheel always features the signature Comté characteristics: they all play with the flavors of onions, garlic, nuts, butter, salt, and potato. It’s just that each of these can come in dozens of variations. They can lean more fruity, vegetative, lactic, spicy, roasted, and more—creating hundreds of possible combinations. Second, when someone buys a piece of Comté cheese, it’s less an act of placing their money in a product and more an act of placing their trust in a set of creators. Whatever Comté comes up with, you can be confident that it will be absolutely excellent. So, clearly, there’s a lot that goes into making Comté cheese! But I share this because it shows how, at every stage, Comté applies its deepest convictions about what makes their work meaningful. Questions like “why do we wake up in the morning” are obviously high-flown, and their answers abstract. But Comté is special because they apply their philosophical perspectives every single moment of every day. Think about how truly impressive that is. How many of us can claim the same about our lives? Do we really know—deep down—why we wake up in the morning? And even if we have an answer, how successfully do we apply it to our lives? Do our convictions about why our lives are meaningful really find concrete expressions in our daily tasks? That’s why I find Comté so inspiring. It’s difficult for us as separate individuals just to figure out how to live our lives like this—but Comté has figured out how to do this with thousands of people together all at once. That’s what makes Comté about so much more than cheese, and it’s what made our trip to their beautiful region so truly special. Thank you to the Comté Cheese association for sending John and I on this magical trip! John and I were not compensated for this post. All opinions are my own. I lived in Southern California for 20+ years, and I can honestly say that I can't remember ever seeing red currants at any of my local markets. Now that I think about it, this fact doesn't come as a huge shock considering where I grew up. Anyway, once I moved to WA, come summer, currants are out and about at many of my favorite markets. I know this won't be the case for everyone, but if you're interested in trying these berries keep your eyes peeled, or simply ask your produce person and hopefully you'll be able to snag a least one small container—I promise they are worth it. Now if you live in the states and you hear someone say the word "currants," you might immediately think of Zante currants, those widely available little dried grapes. But these currants are a totally different thing. These berries are not a grape at all, instead they are a flowering shrub which you can find in various hues like black, red, or white (translucent). These tiny berries are quite tart on their own, which I think makes them quite versatile, so they can easily be folded into a cake, turned into a jam, or even added to a savory dish. Since my experience with currants is super limited I wanted to use them in a familiar baked treat, like this lemon loaf. I am a huge fan of sweets, but I prefer my treats to be not overly sweet. I have been eyeing this lemon loaf from HowSweetEats for a while and I thought the addition of some red currants would add a little contrasting tartness to such an already saccharine treat. Plus, I am a sucker for a good lemon loaf, so making this was a no brainer. This lemon loaf is incredibly moist and fragrant. The lemon zest and currants worked really well together. I only added a cup of red currants, but I actually wish I would have added just a bit more. I am not sure how much longer currants will be available in my neck of the woods, but I am hoping to grab just a few more for an upcoming recipe so stay tuned for more ideas on how to use currants. Heat the oven to 350°F. Light grease the loaf pan and line with a piece of parchment paper. Lay the piece of parchment across the width of the pan, letting a bit hang over. In a small bowl, whisk the flour, baking powder, and salt together. In a large bowl, add the sugar and the lemon zest. Rub the lemon zest into the sugar with your fingers until fragrant. Add the yogurt and whisk until combined. Then whisk in the egg, and vanilla extract until smooth. Add the dry ingredients to the wet, and gently mix until combined. Add the oil to the bowl, and use a spatula to fold into the batter. Once the oil is just incorporated, add the red currants and fold into the batter just 2-3 times. Pour the batter into the prepared loaf pan and sprinkle the top with 1-2 tbs of sugar. Place the pan into the oven and bake for 50 minutes, or until the center is set and a toothpick come out clean when inserted in to the middle of the loaf. Allow the cake to cool in the pan for about 10-15 minutes, then remove from the pan using the excess parchment flaps and set on a cooling rack to cool. Garnish with some extra currants and serve once cooled. Summer in Seattle is such a magical time, and after having returned home from Europe I am more than ready to start cooking up some of my favorite summertime dishes. And one of these is fish tacos—which have this unique ability to instantaneously create a relaxing summer vibe. There’s something about warm corn tortillas, coastal sea fair, and bursts of citrus that puts you in a laid back mood. While some fish taco recipes call for tilapia or salmon, I like to use rockfish or mahi mahi for their mild sweet flavor and flaky texture. This makes them great for tacos, since they’ll impart a wonderful flavor while allowing your seasoning to shine through and your toppings to contribute fresh tastes. I wanted to saturate the fish in a marinade to let all the flavors soak in—oil, lime, spices, and chili powder really transform this fish into something delicious. I also chose to create mango salsa for a layer of juicy sweetness and added some thinly-sliced cabbage for a crunchy, textured finish. I typically lean more towards red wine throughout the year, but I must say that a glass of this pinot gris on a hot day is beyond refreshing. Plus, the bright, pleasant flavors of these fish tacos really find a comfortable companion in a glass of La Crema’s 2016 Pinot Gris. This wine complements the sweetness of this dish with hints of pear and nectarine, but also features a welcomed citrusy bite finishing with a lemony acidity. Be sure to head to La Crema's blog to get the recipe for these tacos and refreshing mango pico de gallo. Hello and happy Monday! If you follow me on instagram you likely already know that John and I have just returned from our trip abroad. Our time in Europe was amazing—the people, the food, the adventure of it all was truly magical. I am in the process of putting together a travel post or two that I hope to post soon. In the meantime, I wanted to share this beautiful summer smoothie that I have been sipping on since I've been back. As much as I loved indulging in all things butter-based in Europe, I must say it feels really good to be back in my kitchen where I can whip up a healthy and easy meal or snack. This smoothie is pretty simple, but it tastes so good since peaches and blackberries are in season now. Now I'm off to make one of these right now—I just can't stop drinking it! Hope you have a lovely week. Place all of the ingredients into a high-speed blender in the order listed and blend until smooth and creamy. If you prefer a thinner smoothie simply add a little extra liquid until desired texture is obtained. Since the arrival summer I have found that not only have my surroundings change (flowers and new produce everywhere) but the way I approach food has as well. I believe that warm summer days call for meals and treats that take little to no effort, but that nevertheless still satisfy. Stone fruits, tomatoes, watermelons, berries—this season yields much of my very favorite fruits and vegetables. In keeping things simple, I am always on the lookout for new ways to enjoy seasonal produce, like these gorgeous apricots I picked up last week. When I bought them John and I only had a few days before our trip to Europe (which we are currently on) and I wanted to put these apricots to good use before we left. Poaching these apricots seemed to be the best way for me to use all of this beautiful fruit without having to destroy my kitchen. Also, having these poached apricots on hand proved to be the perfect thing because they ended up being my last meal before we left for the airport: a bowl of cottage cheese topped with these delicious apricots. Simple, yet delicious! The syrup for these apricots isn't overly sweet, which is something I prefer. I really like how a little tartness comes through from the skin of the apricots, although if you want something a little sweeter, you could always use more sugar. Spoon these yummy apricots over yogurt, ice cream, or eat them on their own—there's really is no wrong way to eat these. John and I are currently traveling through Europe right now, so be sure to check out my Instagram stories to take a peek of the places we visit. Carefully, split the vanilla bean down the middle and scrape out its seeds. Add the seeds and the pod to the saucepan, along with the water, sugar, lemon strips, cardamom pods, and salt. Set the saucepan over high heat and bring everything to a boil, uncovered, and let boil for 1 minute. Add apricots to the saucepan, then adjust the heat so the liquid is at a bare simmer. Poach the apricots, turning over once, until fruit they are tender but still holds its shape and skins are still intact. This can take anywhere from 3-6 minutes, so keep a close eye and test with a knife once you think they are ready. Use a slotted spoon to transfer the apricots to a jar, or large bowl. Bring the syrup to a heavy simmer and let the syrup reduce for an additional 6-7 minutes. Strain the syrup and pour into the jar, or bowl holding the apricots. If you like you can add the vanilla bean pod to the jar, or bowl, but you can also dicard it at this point. Let the apricots and cool to room temperature before using. Store in the fridge in a sealable jar for up to about 5 days or so. One of the reasons I’m so thankful to live in Seattle is not only because of its generally great cuisine, but specifically because of it’s fantastic selection of sandwich shops. Whether you want Southern BBQ pulled pork, a Mexican Torta, a Vietnamese Banh Mi, or anything else you can imagine, Seattle has restaurants, delis, and food trucks serving the best of the best. And in a city so full of great sandwiches, I thought why not become part of the fun? Pretty soon I was inspired, and I set out to explore some unfamiliar territory—I decided to craft a delicious steak sandwich. I thought this would be fun since steak isn’t what I usually gravitate towards unless it’s in a burrito or a fine cut at a similarly fine dinner. After a few attempts a truly tasty meal came together: thin-sliced, high-quality top sirloin, an artisan loaf, the perfect amount of cheese, a fennel and cabbage slaw, a slathering of herbal, creamy basil mayo, a few jalapeños, and pickled onions for a biting vinegar finish. Having nailed my sandwich, I wanted to find something nice to drink alongside it. I turned to La Crema’s ever-impressive collection and found their Monterey Pinot Noir to be a perfect fit. It begins with a toasty mixture of nutmeg and pepper, moving into tart fruits and pleasantly bitter citrus, with a refreshing splash of vanilla and a finish blending cocoa with coffee. It’s utterly delightful on its own and complements this sandwich in a dynamic and surprising way. Be sure to head over to La Crema's blog to get the full recipe for this tasty sandwhich. Thank you SO much for supporting the brands that support The Broken Bread. This is a sponsored post, and as always, all opinions are my won. Add the vinegar, sugar, and salt into the jar that will hold the onions, and stir everything together until dissolved. Par-blanch the onion by placing the onion slices in a fine mesh sieve, then slowly pour the boiling water over them. Let the onions drain, then add to the jar. Add the bay leaf, thyme sprigs, and garlic clove, and stir everything together to help distribute the flavorings. Let the onions sit at room temp for at least 30 minutes, but a few hours is usually best. Store the jar in the refrigerator. These pickled onions are best used within a week, but can last a little longer. Fava Beans, Ricotta & Pancetta On Toast +A GIVEAWAY!!! A couple years ago I received an email from an acquisitions editor asking if I’d like to write a book on toast. At the time I didn’t exactly know how I’d pull it off, but over the course of a few weeks I played with the idea of reimagining how we view and consume toast. I dove headlong into developing one hundred seasonal recipes, which really tested the extent of my creative output, but the result was so satisfying. So when Wolf Gourmet wanted to send one of their new four-slice toasters my way, I thought of how nostalgic it would be to make a meal around a slice of toast again. I wanted something spring appropriate, so I started with a layer of homemade ricotta, then piled on freshly blanched fava beans, then topped it with crispy pancetta and a healthy amount of pecorino cheese. I haven’t really cooked with fava beans before, so I owe the inspiration for this dish to Joshua McFadden’s new cookbook, Six Seasons. In his book he shares a recipe for fava beans on toast, so I took that idea and put my own spin on it. When writing the introductory sections of my book, I realized that we often don’t focus on the various methods available for toasting bread. You can hold it over an open flame, bake it in the oven, or of course just drop it into your ordinary countertop toaster. However, the Wolf Gourmet four-slice toaster is no ordinary appliance. You can control each pair of slots independently, so you can make toast for yourself with waffles on the side, or a set of bagels and english muffins at the same time. It also features extra-wide slots with self-centering bread guides that allow for both the thickest and thinnest slices (which is a BIG deal for me since I love thick slices of toast). Suffice to say, the toaster worked perfectly for this recipe—it’s hard to imagine a better asset for a meal like this. I've really loved using this toaster SO much that Wolf Gourmet is letting me give away one of these beautiful machines to a lucky one of you! Simply follow the instructions below and good luck! Giveaway is open to US residents only and ends on Sunday, May 7th at 12:00 PST. Be sure to head over to my instagram to enter. Wolf Gourmet was kind enough to give me a toaster in exchange for my honest review. As always, all opinions are my own. Good luck!! Shell the fava beans and set aside. Bring a pot of heavily salted water to a rolling boil. Add the fava beans and quickly blanch by letting them cook in the boiling water for 30 seconds, then immediately drain. Rinse the beans under very cold water to stop the cooking process. Using a knife, or your fingers, remove the outer membrane and squeeze out the cooked, fava bean. Using a toaster or a skillet spread a little oil or butter on both sides of the bread and toast until crisp. Divide the ricotta between the two slices of toast. In a small bowl toss the fava beans with the cooked pancetta and divide between both slices. Give each toast a squeeze of lemon, a crack of pepper, and garnish with some pecorino that you can slice or grate over the top. Eat immediately and enjoy! Happy Friday! I'm an SO excited about today's post because I get to share with you one of the most gorgeous concoctions that you'll find in my friend Lily's book, Kale & Caramel: Recipes for Body, Heart, and Table. Lily is the mad genius behind the beautiful blog, Kale And Caramel, a space where she shares her love for food that nourishes the mind and body. With every one of her posts, she takes her readers on both a written and visual journey. She has such a wonderful way with words—able to draw you into her life in an refreshingly raw and honest fashion. Needless to say I feel quite fortunate to know her, and even luckier to call her a friend. Lily's book is simply a beautiful extension of her blog. From the first word and image until the last, Lilly has created a book that tantalizes both mind and eye. She's provided a wide variety of recipes even outside the realm of cuisine which highlights the use of herbs and flowers. Tasty things to eat and drink rest comfortably alongside guides to home-made body care products. I have to be honest and say that I want to make every single recipe in this book. I've already made a few recipes from Lily's book, and this wonderfully vibrant drink is one of my favorites. Fresh lemon juice is blended with cucumber, basil, and topped off with a little soda water to create a drink that's refreshing and energizing. Just the smell of this drink alone is enough to awaken me from my midday slump. With sunnier days coming my way I know this is something I'll be making again and again. I love this book so much that I'm giving away one copy of KALE & CARAMEL: Recipes for Body, Heart and Table over on Instagram to one lucky person. Click here to enter, contest ends Sunday, March 30th. Must reside in the US to enter. This book comes out May 2nd, so make sure to get out there an grab yourself a copy! A few years ago one of my mother’s friends came over to teach us how to cook some delicious and authentic Thai food. She showed us how to make a sweet and vibrant mango salad, a wonderfully spicy Thai Curry, and finally, what became my personal favorite—a classic Tom Kha Gai soup. I’ve always found Thai food so intriguing for its innovative use of diverse ingredients, with many of which I’d otherwise be pretty unfamiliar. And as I thought about this wonderful Tom Kha Gai I had just a few years back, I knew I wanted to make my own Thai-inspired soup using ingredients that could expand my creativity. My basic trajectory was pretty simple: make a tasty soup that was true to the traditional process but which also took the dish in a new direction. So while the initial soup usually included chicken and mushrooms, I decided to incorporate other fresh and original ingredients like rice noodles, bell peppers, and broccoli. Two of the most unique elements in this recipe are kaffir lime leaves and galangal. Kaffir lime leaves, I believe, are one of the key reasons as to why this soup tastes so good. They exude a powerful citrusy fragrance that really add a brightness to this dish. The other unique ingredient you’ll find in this soup is galangal. It has been compared to ginger, and while it bears some similarity it’s also more spicy, with an aromatic piney scent and complex flavor. It helps bring an unfamiliar, exotic spicy layer to the soup that introduces unexpected flavors. What I love most about using unique ingredients like these is that I get to go out and visit new markets. While most of the components for this soup can be found at your local store, I did have to venture out to a new Asian market for these two ingredients. Being in a new market is always a fun experience for me. I mean, being surrounded by new produce pushes me into foreign but exciting exciting territory. So if you find yourself on the hunt for these ingredients, try to find a local Asian market and take a trip—you won’t regret it! I encourage you to call ahead if possible, but if you can't just get out there and see what you find. These ingredients really make a difference in this soup, so the extra trip will be worth it. Knowing that I wanted to pair this soup with a great drink, I found La Crema’s 2015 Monterey Pinot Gris to be pretty perfect. It has a citrus blast at the beginning which settles down into a melon-like sweetness. This seriously enhances the whole experience and makes for a pleasant pairing. For the whole soup recipe, be sure to check out La Crema’s blog. Last week John and I met up with our niece to catch up, drink some beer, and muse upon our hopes and dreams. Somewhere throughout the conversation, she told us about this new drink she’s been making (she’s quite the talented barista). This is how she does it: she begins by muddling an orange peel with melted dark chocolate ganache, then pulls a shot of espresso through cinnamon that’s been dusted on the machine, then tops the finished product with steamed milk. As I listened to her describe this admittedly creative and unique take on a familiar drink, I started soaking up inspiration for what would eventually become these sundaes. It’s a pretty straight-drawn line from inspiration to creation—a beautiful blend of rich chocolate, bright citrus, aromatic coffee, and soothing whipped cream. I decided to use bittersweet chocolate and espresso powder to create a depth of chocoltaly flavor , fresh orange zest for a sweet citrus burst. These chocolatey squares strike a great balance between the two attributes of every good brownie—they have both a fudgy chewiness and a cakey fluffiness. Best of all, they achieve that ever elusive and ceaselessly sought-after shiny, crackly crust. Now one thing to remember is that while of course these brownies find a comfortable place when nestled into a sundae, they also taste just as amazing on their own. I didn’t include an exact recipe for these sundaes since everyone will likely prefer different ratios of brownie-to-ice cream. Instead I wanted to give you the inspiration to make these sundaes if you find yourself wanting to turn this batch of brownies into something new. Thank you for the inspiration for the recipe Rebecca, love you! Heat oven to 350°F. Lightly grease an 8x8 square baking pan and line with two strips of overlapping parchment paper. Be sure to leave a little over hang as this helps during the removal process. Whisk together flour, salt, and baking powder in small bowl and set aside. In another bowl combine the sugar and orange zest by rubbing together with your fingers until fragrant and the zest has been incorporated into the sugar. Add the butter to a saucepan and set over medium-low heat. Once melted add in the both chocolates, vanilla extract and espresso powder and mix until smooth. Transfer the melted chocolate mixture to a large bowl. Whisk the sugar into the melted chocolate mixture. Once combined, beat in the eggs one at a time until smooth. Fold the flour into the melted chocolate mixture with a spatula until smooth, then pour the mixture into the prepared pan. Bake for about 30-35 minutes, or until a toothpick inserted into the center only has a few moist crumbs attached. Place on cooling rack to cool. Once cool, remove from pan and cut into 16 squares. Tip: Wipe knife between cuts for cleaner edges on the brownies. Simply cut the brownie into desired sized pieces. Top the brownie with a generous scoop of coffee ice cream, (I got mine from Molly Moon's), a dollop of whipped cream, and some chopped hazelnuts. And that's all it takes to make the sundae of your dreams! Seattle has been really, really wet and grey this Winter. This may not come as a surprise because, duh it's Seattle, but this year has been especially dark and wet. Thankfully there's finally light at the end of the rainy tunnel because today is the first day of spring, which means a change of weather is on the horizon. To celebrate the new season I filled my office with bright flowers and decided to bake something special for John and I, which ended up being this gorgeous double citrus cardamom loaf. Linda Lomelino recently shared a recipe for her Blood Orange & Black Sesame Seed Loaf and I instantly fell in love. Her photography is stunning, but her use of color is what captured my attention. Just looking at her pictures made me so happy that I wanted to keep that feeling alive, so I gathered my ingredients and made a slightly adapted version of her loaf. Orange, lemon, and cardamom are the three main flavors you'll find in this loaf, and they all compliment each other beautifully. As you look over the recipe there is one step that may be new to you, as it was to me, and that is to rub the orange zest into the sugar before adding it to the butter. I picked up this tip from Yosi Arefi's book, Sweeter of the Vine, and I do it every time I add citrus zest to my baked goods. I really love this extra step because rubbing the zest into the sugar further infuses the citrus oil which increases its flavor presence in this recipe. By no means does it make the orange flavor overwhelming, instead it makes it more present, which is exactly what I love about this loaf. While it may not feel like spring for a while in Seattle, at least I know I can bring that spring-time feeling indoors by surrounding myself with bright colors and flavorful treats like this loaf which are great reminders of what's to come. Heat oven to 350° F. Lightly grease and flour a 9x5 inch loaf pan; tap out any excess flour. Mix together the flour, baking powder, salt, and cardamom until combined; set aside. In another bowl add the sugar and orange zest and begin to rub with your fingers until fragrant and the zest has been incorporated into the sugar. Add the sugar to the butter and beat until light and fluffy, about 2 minutes. Add the vanilla and the eggs, one at a time, beating after each addition. Add the flour mixture, blood orange juice and milk in additions to the butter mixture and stir until just combined. Pour the batter into the prepared loaf pan, smooth the top, and place on the lower oven rack. Bake the loaf for about 75 minutes, but Linda mentions that its best to start checking around 60 minutes. She also suggests to cover the top of the loaf with foil if the loaf is getting too much color. Remove the loaf from the oven when a cake tester inserted into the middle comes out clean. Allow the loaf to cool for about 15 minutes, then invert on to a rack to cool completely. Once completely cooled, top with glaze and enjoy. Mix all ingredients together in a small bowl until smooth. If the texture seems too thick, add a little more lemon juice. Alternatively, is a thicker texture is desired simply add more powdered sugar. Enchiladas bring me back to my roots. Even an infrequent glance at The Broken Bread will reveal to any reader that my Mexican upbringing has contributed incalculably to my cooking. Enchiladas is no exception, and it’s been one of my favorite dishes since childhood. For this recipe, I wanted to do justice to a solid, classic plate of enchiladas while giving them a fresh twist. I landed on a spicy, smoky chipotle sauce. This drenches the whole dish with the fragrance of char and a gentle nudge of heat. So perfect. Having locked down my special sauce, I turned my attention towards how I’d prepare my enchiladas. While these are usually rolled up individually, I instead layered all the ingredients together in a skillet which made for a welcomed shortcut. I also found that La Crema’s Monterey Pinot Noir paired very well with this dish. It excellently combines the aroma of plums, the taste of cherry and coffee, and a sweet yet spicy finish. Be sure to head over to La Crema’s website for my full enchilada recipe. Before John and I set out for our honeymoon, we received a piece of advice from uncle Paul and aunt Jackie that we’ll never forget. They laid out for us the two main ways one could embrace travel. One way was to blow all your money in a week on exuberant food and lodging for an admittedly fantastic and thrilling experience. But the other way was to trickle your money out slow, staying in humble hostels, feasting on baguettes and wine by a river or on the steps of an aged cathedral, soaking up every moment enthralled more with one another than with whatever money alone can secure. Wielding the latter piece of this advice to navigate our honeymoon like one would a map to explore a city, we set off to spend a whole month traveling through Europe. Now on this trip of ours, we spent most our time carving through the wonderful city streets of Rome, Venice, and Florence. And when looking back on these sweet Italian memories, one thing in particular remains at the fore: the scrumptious, delectable, never-ending pasta. We enjoyed this classic meal so many times and in so many ways that we knew we had to get our hands on a pasta maker once we were back in the states. And that brings me to this delicious herbed pasta. Basil and garlic lend a welcomed, delicate flavor while parmigiano-reggiano and olive oil impart a buttery, salty texture. And since making pasta with a hand-cranked machine takes long enough as it is, I started with a blender to whip up my dough. I used Vitamix’s new A3300 blender to tackle this task, and with it I had my dough ready in mere seconds. Now this beautiful machine is part of an exciting new series of blenders from Vitamix, and so I thought it would be splendid to host a giveaway so one of these could find their way into your home. In order to enter, just leave a comment below telling me what you would make with this blender if you won! Just remember that you must be 18 or over and a resident of the United States to enter. Good luck! Contest is now closed. Congrats to Kelli W.!! Thank you for all of the amazing entries! I know making pasta at home can seem like an intimidating process at first, but I promise it's way easier than you think. I've included a few tips and links below to help you on your pasta-making journey. Thank you for supporting the brands that support The Broken Bread. All opinions are my own. Place the two eggs, two yolks, olive oil, garlic, and basil into the Vitamix container and secure the lid. Select Variable 1 (not 1+), turn the machine on, and slowly increase speed to the highest setting. Blend for 20 seconds. Remove the lid and add the flour and the salt. Place the lid back on and select variable 3. Using the pulse button, pulse 5-6 times. The dough should start to come together. Remove the lid and scrape down the sides as necessary. Place the lid back on and pulse the dough an additional 5-6 times. Remove the lid and check the dough. If it seems wet and sticks to your finger when touched, sprinkle in a bit more flour, and pulse an additional 2-3 times. The dough should form a ball at this point, but it's also okay if a few pieces don't fully incorporated. Dump the dough onto a lightly floured work surface and knead for 4 minutes. If the dough feels sticky and clings to your hands, continue to sprinkle in some additional flour and continue kneading. Once the dough is smooth and elastic, tightly cover in plastic wrap and let rest at room temperature for 30 minutes. Cut dough into four pieces. Working with one piece at a time (leaving the others wrapped), lightly dust the portion with flour and flatten into a disc with your hand. Next, feed the piece of dough through your pasta machine starting on the widest setting. Do this two times. Fold your dough into thirds and feed it through the pasta machine lengthwise. Do this two times as well. Adjust the machine to the next setting and continue to roll out the pasta dough, 2 passes for each setting, all the way down to the last and narrowest setting. Once on this last setting, the pasta strip will likely become quite long, so go ahead and cut it in half—this will make it easier to handle. Use the machine's fettuccini attachment to cut the pasta into strips. Dust with flour or semolina if using right away, and lay out onto a baking sheet. Alternatively, you can also dust the pasta and gently form into nests. If not using the pasta right away you can place it on a drying rack and let dry overnight. Repeat this process for the 3 other pasta portions. If cooking right away, pasta will cook in heavily salted, boiling water in 2-3 minutes. Top with your favorite sauce and enjoy. The most important thing to pay attention to when making pasta is to focus on the texture of the pasta dough. If the dough is too sticky you'll end up with one big mess in the end, so let the pasta dough tell you how much flour it needs and add accordingly. The goal is to have a ball of dough that isn't sticky, but is still slightly moist and pliable. Alternatively, if you find your dough to be to dry, add a tiny drop of water until the texture of the dough corrects. I found this article to be very helpful, it even suggested using a water spray bottle if you end up with dry dough, which I found to be genius! If you don’t have a pasta machine, check out Cooks Illustrated or Bon Appetit for tips on how to make pasta without one. A few years ago I took my brother to this ice cream shop in Anaheim, CA that served these pre-made ice cream bars that you could custom dip in whatever type of chocolate you wanted. He got a peanut butter bar dipped in chocolate (which was delicious) and I got a matcha bar dipped in white chocolate (which was even better). This flavor combination might sound a little weird at first, especially if you aren't a fan of white chocolate, but I promise it is SO good. While strawberries aren't really in season I couldn't resist grabbing some at the store. Winter has been weighing on me lately, and biting into a strawberry is the closest thing I have to the joy of the warmer months yet to come. I actually lucked out because the berries I got tasted way better that expected—making them perfect for my chocolate-dipping endeavors. I know that sharing a recipe for chocolate dipped strawberries as a Valentines's Day dessert is very cliche, but these strawberries are a whole new take on the tradition. Holiday or not these matcha flavored treats are begging to be made. Add the chocolate chips and coconut oil to a bowl and melt. This can easily be done in a microwave—simply microwave in 2-3 30 second intervals, mixing in between until chocolate is melted. Alternatively you can melt the chocolate an coconut oil in a saucepan over low heat until smooth. Once the chocolate is melted, remove 11/2 tablespoons of the white chocolate and pour it into a separate bowl. Whisk in 2 1/2 teaspoons of the matcha powder into the white chocolate until smooth. Taste, and add an additional 1/2 teaspoon if desired. Dip each strawberry into the white chocolate mixture and set on a piece of parchment paper. Once all strawberries have been dipped, dip a fork or a knife into the small bowl of the reserved melted white chocolate and drizzle in a "Z" motion over each strawberry. Allow the chocolate to firm up before serving.